Dumplings with meat is one of the most popular Polish meals. Pierogi, because that is how they are called are very delicious and various. If I had to choose one dish that my mother had to cook for me when I am visiting, that would be Pierogi. Those small dumplings have very soft filling and batter. 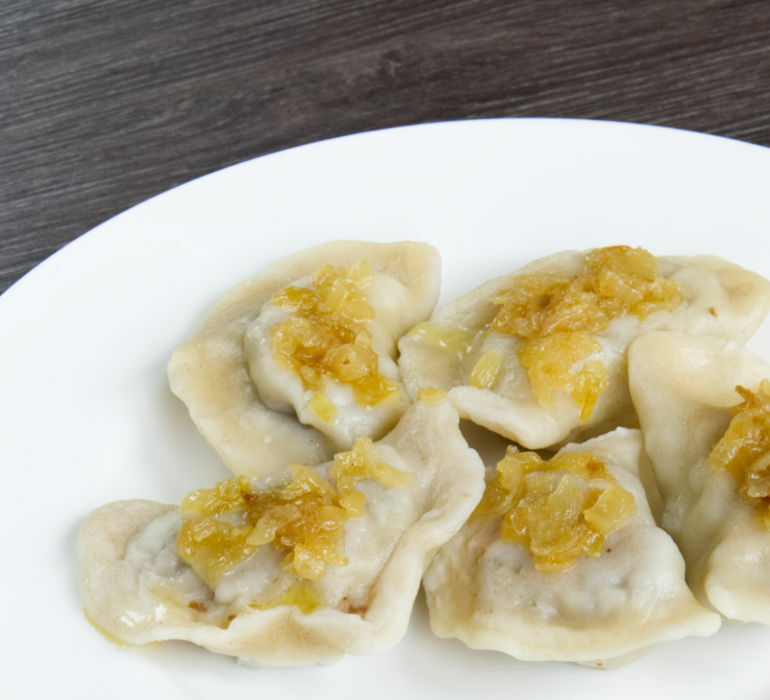 If Pierogi came from China or Kiev is still unknown, there are a lot of legends that support both stories. The dish was mentioned already in the 17th century and there were different shapes and fillings prepared for different occasions. Polish dumplings can be filled with different fillings: the most popular and my favourite one is the potato-quark filling, but there is also sauerkraut-mushroom filling, meat filling and even berry/fruit fillings. All pierogi are cooked in salted water until tender and served with butter and onion or powdered sugar. Pierogi with meat are served with melted butter (lots of melted butter :)) and chopped onion. They can be also fried before serving, although I prefer them cooked version because this way the dough is much softer. If you are in Poland and you see on the menu “baked” pierogi, it actually means that they are deep-fried which has nothing to do with the traditional way of serving them. The cooked version still wins! 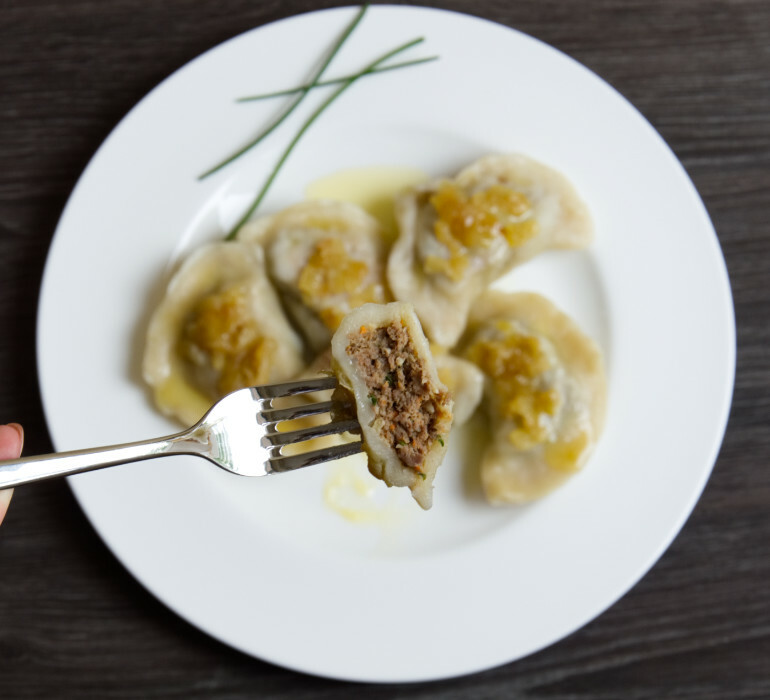 Below you will find 2 filling options for this dish, so you can choose which meat you would like to use to make Pierogi. I also recommend to add one bread roll, soaked in cold water. This way the filling will be fluffy and soft! First, you need to prepare the filling. In the large pot cook together meat, vegetables, parsley, salt, pepper, allspice and bay leaves in hot water for 40-50 minutes or until the meat is soft. While the meat cooks you can prepare your dough. Take a large mixing bowl, combine flour and a bit of warm water. Knead the mixture into soft dough. If the dough is sticky add more flour to it. Divide the dough in half. After meat and vegetables are ready take them out from the pot and let them cool down. Keep the broth! We might need it for the preparation of the filling! Grind the meat and vegetables in a meat mincer. Squeeze the bread roll so it does'nt contain any water, add to the mixture with salt, pepper and marjoram. At this point try the mixture and correct the seasoning. Add raw eggs into the stuffing. Mix all ingredients well. Clear a large space on the counter. Prepare: bowl of filling with a tablespoon, dough, additional flour, coffee mug and rolling pin. Place 1 tablespoon (or less!) of the filling in the centre of each circle of dough and fold over. Press and seal into half-moon shapes. You can use a little bit of warm water to seal the pierogi. If the dough sticks to your fingertips - put them in a bit of flour. Put your dumplings on a floured surface, so they don’t stick to the counter. Cover your dumplings (even while making them!) with a clean kitchen cloth, so they don’t dry out. In the meanwhile peel the onion and cut it into cubes. Fry onion on the frying pan with the addition of butter, until tender. Cook the pierogi in a pot of boiling, salted water until they float. After floating cook them for another 3 min then remove them from the water and drain. Melt 2 tablespoons of butter in a saute pan, fry chopped onion until tender, add pierogi to the mixture and sear them for 2 to 3 minutes on each side, or until they are golden brown.